When you’re expecting an overnight guest, or planning a trip, a blow-up bed is the perfect, fastest, easiest option. The best air mattress can be used pretty much anywhere, for a camping trip, dorm use, or in a hotel room for extra sleeping space, but finding one that doesn’t leak or is actually comfortable to use can be a real challenge. The SoundAsleep Dream series air mattress comes equipped with Comfort Coil technology and a high capacity pump, so you can air it up or collapse it in just a couple of minutes. This model was rated one of the top air mattresses on the market and it has a reputation for versatility and durability. This SoundAsleep inflatable bed has earned quite the reputation due to the innovative coil system, a feature that makes it feel like you’re sleeping on a traditional pillowtop bed. But there are some downsides to this design that we’ll touch on later in this review. If you’re shopping around for a new air mattress, then the odds are you’re looking for a model that won’t constantly leak air like your last one, or dip in the middle if more than one person sleeps on it. Often, sleeping on an air mattress can cause a number of back and neck problems because these beds lack any type of support. But the Dream series changes all of that due to its innovative coil design that takes air mattress quality up a notch. So, what makes this model the best air mattress on the market? To start, it’s easy to use and inflates and deflates quickly, in as little as four minutes. The mattress is equipped with a built-in pump for added convenience. The pump features a simple toggle device for deflation or inflation. We love that the pump is integrated into the bed, so there’s no extra equipment to haul around or keep track of. You’ll need to top the mattress off with additional air with each use, or every two to three days. The built-in pump makes it simple to fine-tune the firmness of this sleeping surface. This model comes with a storage bag that’s equipped with handles for easy travel and storage. When deflated, the bed weights approximately twenty pounds, measuring in at twelve by twelve by twenty-four inches and a height of nineteen inches. We can honestly say; this air mattress feels like a real bed. The bed comes with a total of forty internal air coils for back support. It’s also true to standard queen size, so you’ll have plenty of space to stretch out, even with two users. Like any other air mattress, this one tends to get a little cold at night if you don’t place a sheet or blanket over the surface. The mattress is constructed from durable fifteen-gauge material, with a waterproof top. Over time, this is an inflatable bed that holds up well. The bed’s large sleep surface is supported by forty coils, which work to create a flat surface that’s able to maintain its firmness and shape, with minimal air loss throughout the night. The built-in pump is very user-friendly compared to other models on the market. You can plug the cord into any standard outlet. Working the pump is simple, just turn the toggle clockwise to inflate the mattress or counterclockwise to deflate it. Unfortunately, the pump also generates a fair amount of noise, however, this is a common issue with any inflatable mattress electric pump system. Pros: The internal pump makes inflating and deflating the mattress fast and easy. The bed is also equipped with a Sure Grip bottom that keeps the bed in place so it won’t slip around the floor as you toss and turn in your sleep. The flocking on the top of the bed works to keep the bedding in place. 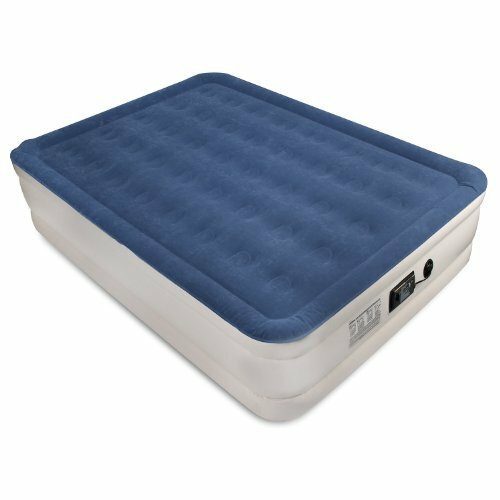 Reinflation during use with air mattresses is pretty common, but it happens less often with this Dream Series model. This mattress has a weight capacity of five hundred pounds, which is considerably more than other models in this price range. The bed is made from several layers of puncture-proof materials so you won’t have to worry about tears or holes. We also noted that deflating and inflating the bed didn’t contribute to wearing out the material. The manufacturer also offers a one-year product warranty. This bed has a more extensive coil system compared to other air mattresses on the market. The coil system allows two people to sleep on the mattress without causing any dipping in the middle of the sleep surface. Not only is this bed self-inflating, but it also easily beats out the competition when it comes to not losing much air pressure during the night. Even after several months of use, consumers reported that the mattress didn’t stretch out and was able to maintain its shape. If you’re looking for the right pillow to complement this mattress, take a look at the Mediflow water base pillow, which is the perfect model for people who suffer from ongoing neck pain. Cons: This mattress tends to work best with deep fitted sheets. We found that standard sized sheets were just too tight of a fit. The only real downside for some buyers is the weight of the mattress which can make it difficult for use on a camping trip. Most of this weight is due to the extensive coil system. The SoundAsleep Dream series queen sized mattress offers the type of comfort that allows you to rest easy throughout the night. Overall, this model is one of the top air mattresses we’ve tried, earning top marks for durability, comfort, and quality. The coils make this bed surprisingly comfortable to use and it’s the perfect option for camping, travel or for guest use. Consumers who purchased this model gave it a rating of five out of five stars. 123 Fifth Avenue, NY 10160, New York, USA.